Yes, I’m a bit late. We have had such a full past week, with all sorts of family and sports obligations. Then on Saturday Nick and I went to a wedding reception. I actually danced in four inch heels, and boy did I feel it the next day! We were so ecstatic to have time to ourselves that we hung out at a bar on the way home and then kept ourselves up till 2:00 a.m., not at all the norm for us anymore. Then on Sunday I was lucky enough to go to San Juan Capistrano with a wonderful group of friends, all of whom I met online. This is a photo taken by a man who worked at a beautiful store called “Whim”. This was the one store in town where things were not outrageously overpriced, and the salespeople were not only knowledgeable, but funny and friendly, from the elegant woman who showed us the Book of Breasts, to the young, pierced guy who wrapped our packages. Not coincidentally, this was the only store in which we bought anything. It certainly is a new world we’re living in, isn’t it? I have been officially addicted to the internet since 1996, although I was utilizing it long before that. In that time I have met well over 60 people in “real life” whom I first met online. I also have many dear friends whom I have not yet had the chance to meet. 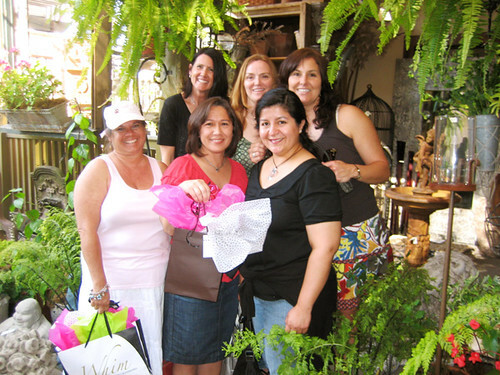 But these “girls” all live within a couple of hours of me, so we decided to meet up in San Juan Capistrano. We spent the day window shopping and had Mexican food for dinner. 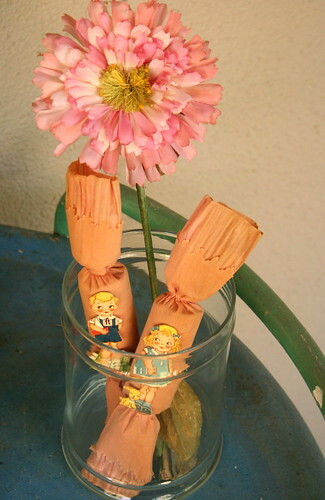 I bought the most delicious smelling bar of linden scented soap and a hilarious greeting card. It was great to see everyone again (except we missed a few friends who couldn’t make it! ), and really nice to get away for a few hours. We spent our Easter at my in-law’s house. 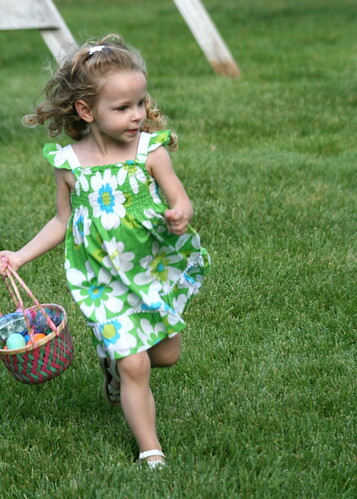 They have a wonderful yard for an egg hunt. I hardly photographed my own kids, since they are big lugs now ;p, but a friend brought her sons and grandbabies, so I did snap a few shots. On Saturday I went to a few garage sales, hoping to find some valuable used books (I probably got about $250 worth of books-half of that goes to me). I also lucked into a sale with lots of vintage goodies. I got this lot here (and a new-with-tags dress from Nordstrom Rack and a stack of magazines) for $7. Can you believe it? 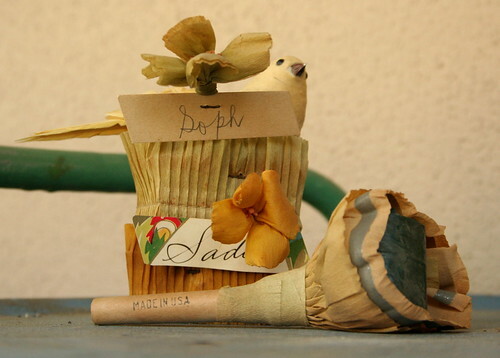 ~ by bekaboo on April 21, 2009. Wow, it looks like you had a busy weekend. 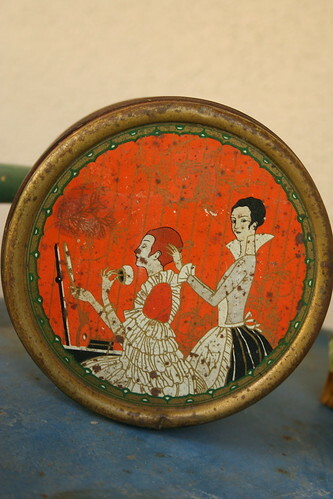 I have only recently followed your blog, but I enjoy reading about your life and seeing your thrifty finds. The red price cards are marvelous, and I think I have a clothes line like you found. 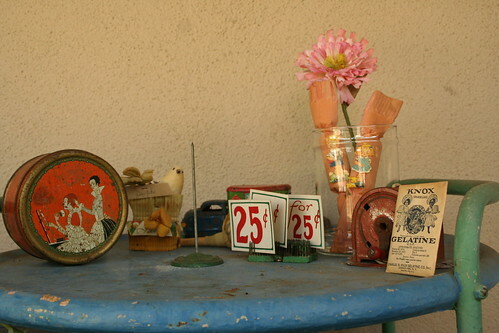 the vintage party goods are neat, too. I’m glad you had a good Easter and lots of fun with friends! so bummed I missed the day with you guys! Sounds like you had fun! Great garage sale finds!!! 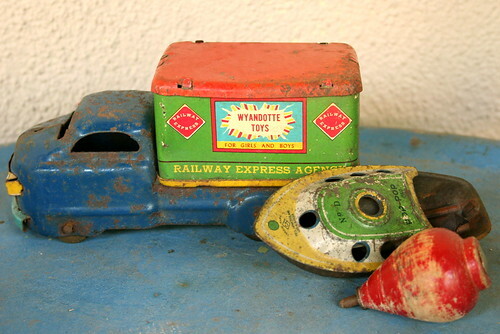 love the vintage lot… especially the tin!! what a fab time you ladies had. Love the internet and how you can make and meet new friends. Love the goodies you found. I love these vintage things. I had a rusty boat just like the one in your photo. Good old memories! Thank you. 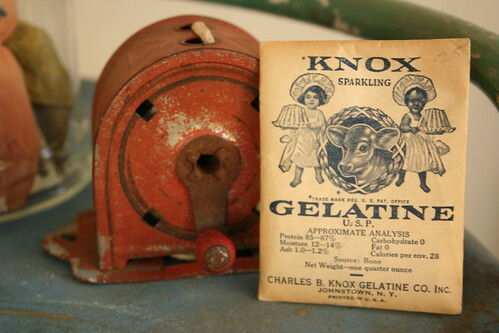 Now with that Knox gelatine you could make some lovely vintage/retro molded salads with bits of things suspended in jellied beef stock or something. Note I didn’t say you’d have to eat it! Little late on the commenting but I love those finds! 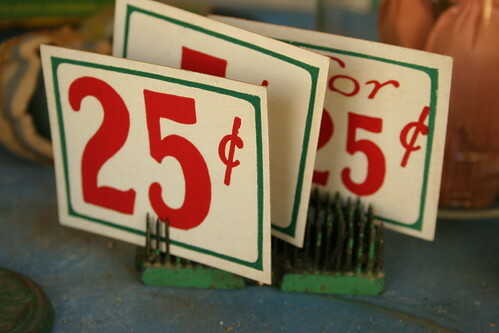 Especially the old price tags and frog.